Side channel effects such as temporal disparity and intensity fluctuation of the photon pulses caused by random bit generation with multiple laser diodes in high-speed polarization-based BB84 quantum key distribution (QKD) systems can be eliminated by increasing the DC bias current condition. However, background photons caused by the spontaneous emission process under high DC bias current degrade the performance of QKD systems. In this study, we investigated the effects of spontaneously emitted photons on the system performance in a high-speed QKD system at a clock rate of 400 MHz. Also, we show further improvements in the system performance without side channel effects by utilizing the temporal filtering technique with real-time field-programmable gate array signal processing. J. Y. Wang, B. Yang, S. K. Liao, L. Zhang, Q. Shen, X. F. Hu, J. C. Wu, S. J. Yang, H. Jiang, Y. L. Tang, B. Zhong, H. Liang, W. Y. Liu, Y. H. Hu, Y. M. Huang, B. Qi, J. G. Ren, G. S. Pan, J. Yin, J. J. Jia, Y. A. Chen, K. Chen, C. Z. Peng, and J. W. Pan, “Direct and full-scale experimental verifications towards ground-satellite quantum key distribution,” Nat. Photonics 7, 387–393 (2013). S. Nauerth, F. Moll, M. Rau, C. Fuchs, J. Horwath, S. Frick, and H. Weinfurter, “Air-to-ground quantum communication,” Nat. 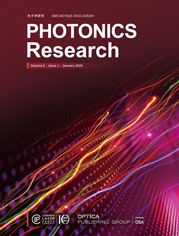 Photonics 7, 382–386 (2013). T. Schmitt-Manderbach, H. Weier, M. Fürst, R. Ursin, F. Tiefenbacher, T. Scheidl, J. Perdigues, Z. Sodnik, C. Kurtsiefer, J. G. Rarity, A. Zeilinger, and H. Weinfurter, “Experimental demonstration of free-space decoy-state quantum key distribution over 144 km,” Phys. Rev. Lett. 98, 010504 (2007). S. K. Liao, H. L. Yong, C. Liu, G. L. Shentu, D. D. Li, J. Lin, H. Dai, S. Q. Zhao, B. Li, J. Y. Guan, W. Chen, Y. H. Gong, Y. Li, Z. H. Lin, G. S. Pan, J. S. Pelc, M. M. Fejer, W. Z. Zhang, W. Y. Liu, J. Yin, J. G. Ren, X. B. Wang, Q. Zhang, C. Z. Peng, and J. W. Pan, “Long-distance free-space quantum key distribution in daylight towards inter-satellite communication,” Nat. Photonics 11, 509–513 (2017). J. Yin, Y. Cao, Y. H. Li, S. K. Liao, L. Zhang, J. G. Ren, W. Q. Cai, W. Y. Liu, B. Li, H. Dai, G. B. Li, Q. M. Lu, Y. H. Gong, Y. Xu, S. L. Li, F. Z. Li, Y. Y. Yin, Z. Q. Jiang, M. Li, J. J. Jia, G. Ren, D. He, Y. L. Zhou, X. X. Zhang, N. Wang, X. Chang, Z. C. Zhu, N. L. Liu, Y. A. Chen, C. Y. Lu, R. Shu, C. Z. Peng, J. Y. Wang, and J. W. Pan, “Satellite-based entanglement distribution over 1200 kilometers,” Science 356, 1140–1144 (2017). S. K. Liao, W. Q. Cai, W. Y. Liu, L. Zhang, Y. Li, J. G. Ren, J. Yin, Q. Shen, Y. Cao, Z. P. Li, F. Z. Li, X. W. Chen, L. H. Sun, J. J. Jia, J. C. Wu, X. J. Jiang, J. F. Wang, Y. M. Huang, Q. Wang, Y. L. Zhou, L. Deng, T. Xi, L. Ma, T. Hu, Q. Zhang, Y. A. Chen, N. L. Liu, X. B. Wang, Z. C. Zhu, C. Y. Lu, R. Shu, C. Z. Peng, J. Y. Wang, and J. W. Pan, “Satellite-to-ground quantum key distribution,” Nature 549, 43–47 (2017). H. Ko, K. Lim, J. Oh, and J. K. K. Rhee, “Informatic analysis for hidden pulse attack exploiting spectral characteristics of optics in plug-and-play quantum key distribution system,” Quantum Inf. Process. 15, 4265–4282 (2016). S. Nauerth, M. Furst, T. Schmitt-Manderbach, H. Weier, and H. Weinfurter, “Information leakage via side channels in freespace BB84 quantum cryptography,” New J. Phys. 11, 065001 (2009). K. Nakata, A. Tomita, M. Fujiwara, K. I. Yoshino, A. Tajima, A. Okamoto, and K. Ogawa, “Intensity fluctuation of a gain-switched semiconductor laser for quantum key distribution systems,” Opt. Express 25, 622–634 (2017). H. Ko, B. S. Choi, J. S. Choe, K. J. Kim, J. H. Kim, and C. J. Youn, “Critical side channel effects in random bit generation with multiple semiconductor lasers in a polarization-based quantum key distribution system,” Opt. Express 25, 20045–20055 (2017). C. H. Bennett and G. Brassard, “Quantum cryptography: public key distribution and coin tossing,” in IEEE International Conference on Computers, Systems, and Signal Processing (1984), pp. 175–179. L. A. Coldren, S. W. Corzine, and M. L. Mashanovitch, Diode Lasers and Photonic Integrated Circuits (Wiley, 2012). M. Dusek, M. Jahma, and N. Lutkenhaus, “Unambiguous state discrimination in quantum cryptography with weak coherent states,” Phys. Rev. A 62, 022306 (2000). G. Brassard, N. Lutkenhaus, T. Mor, and B. C. Sanders, “Limitations on practical quantum cryptography,” Phys. Rev. Lett. 85, 1330–1333 (2000). X. B. Wang, C. Z. Peng, J. Zhang, L. Yang, and J. W. Pan, “General theory of decoy-state quantum cryptography with source errors,” Phys. Rev. A 77, 042311 (2008). M. Hayashi and R. Nakayama, “Security analysis of the decoy method with the Bennett-Brassard 1984 protocol for finite key lengths,” New J. Phys. 16, 063009 (2014). A. Mizutani, M. Curty, C. C. W. Lim, N. Imoto, and K. Tamaki, “Finite-key security analysis of quantum key distribution with imperfect light sources,” New J. Phys. 17, 093011 (2015). H. K. Lo, X. Ma, and K. Chen, “Decoy state quantum key distribution,” Phys. Rev. Lett. 94, 230504 (2005). X. Ma, B. Qi, Y. Zhao, and H. K. Lo, “Practical decoy state for quantum key distribution,” Phys. Rev. A 72, 012326 (2005). Fig. 1. Experimental setup for measuring performance degradation of a polarization-based BB84 QKD system under high DC bias current. An example of aperiodic current signals generated from a FPGA is depicted. FPGA, field-programmable gate array; LD, laser diode; Sync. LD, synchronization laser diode; Sync. PD, synchronization photodiode; DM, dichroic mirror; HWP, half-wave plate; ND filter, neutral density filter; PBS, polarization beam splitter; BS, beam splitter; PD, photodetector; SPD, single photon detector. Fig. 2. Detection probability distribution of the received signals under IDC=0.95Ith, which was estimated at the FPGA with a timing resolution of 125 ps. CSE represents the photon counts created by the spontaneous emission process. Fig. 3. Side channel effects and the performance of the QKD system under IDC=0. (a) Side channel effects of temporal disparity and intensity fluctuation. Second pulses out of two consecutive pulses in a 1 s time block are measured for different time intervals from 2.5 to 40 ns. Details of the measurement methods are described in . (b) QBER as a function of the signal window with temporal filtering. The signal window was resized from 2.5 to 0.5 ns, with a resolution of 0.25 ns. (c) Sifted key rate and secure key rate as functions of the signal window with temporal filtering. Fig. 4. Side channel effects and performance of the QKD system under IDC=0.95Ith. (a) Side channel effects of temporal disparity and intensity fluctuation. Second pulses out of two consecutive pulses in a 1 s time block were measured for different time intervals from 2.5 to 40 ns. Details of the measurement methods are described in . (b) QBER as a function of the signal window with temporal filtering. The signal window was resized from 2.5 to 0.5 ns, with a resolution of 0.25 ns. (c) Sifted key rate and secure key rate as functions of the signal window with temporal filtering. Fig. 5. Spectral characteristics of photon pulses for different DC bias and AC pulse conditions.